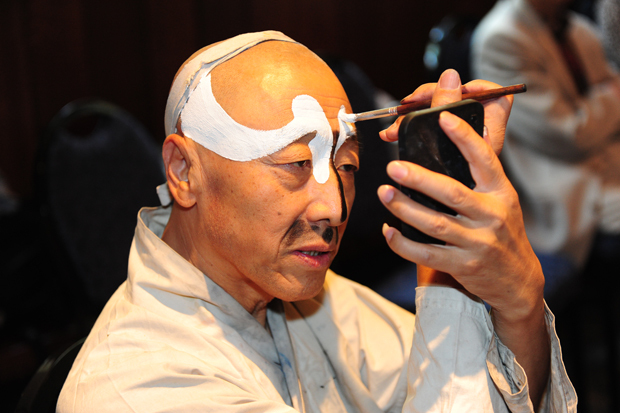 the beautifully drawn masks that you see on the faces of chinese opera performers are the result of tedious efforts. every line is drawn and every colour is filled in with paint brushes. this task of drawing and painting is done by a make-up artist or the performers themselves. you can practise drawing a face mask too! first, you need to study the actor's face as the designs will depend on the shape of his face. then, you must decide on the role that the actor will play as the mask designs and colours should bring out the personality and the roles of the actors and actresses. now, let us show you the step by step method of face painting. clean the face and put on base powder. then, knead the whole face completely to make it easy for drawing the outline of the sketch. decide and draw the eyes, and sides of the nose. dip fine blue color by hand and apply to the forehead column and cheek contours. next, dip fine black paint and fix the position of the eyes, nose sides. put aside the white eyeballs position inside the eyeholes. do you notice that the above two steps are completed only by using fingers? thus, this process of face painting is called "knead by fingers." fill in with white powder base after drawing the outline with a pen brush. then, draw the courage shape yin tang lines, eyebrows, white lines between the two eyebrows, white lines under eye socket, colored nose sides base and two white falling lines near side of the nose. finally, draw the white eyeballs in the black eyeholes and draw the chin white. using chinese line ink, outline the black eyeholes again with pen brush. fill in the small mouth corner black. next, draw a smaller line between each eyebrow and near the eyeholes. finally, draw two lines that hook sharply in the white chin. use red color to draw the red courage lines in the yin tang center lines. then, fill in the nose area at the side so that it looks turned over. next, fill in the red eyebrow ends and red lip carefully. complete the look by drawing in the blue lines and yellow eyebrow ends and fill in the blue brow and cheek. now, the mask is complete. can you guess the character traits of this mask?